This is where we stand to start with. I used the info that you gave to simison to try and put all the homeworlds in roughly the right places, for those that gave locations. If it doesn't look right tell me and I'll try and move you to the right place. Where places seem to be located in different locations depending on source (Stygies & Gryphonne at least) I've used the FW location. Edited by Lord Thørn, 28 November 2017 - 10:48 PM. Okay, now that I'm not looking at this from my phone, it's a lot different than the map I was using. Could you also link homeworld to legion in the description? I'm still learning the names. Looks good, Sarum is well placed, but it is geographically above (on the map) the Maelstrom. 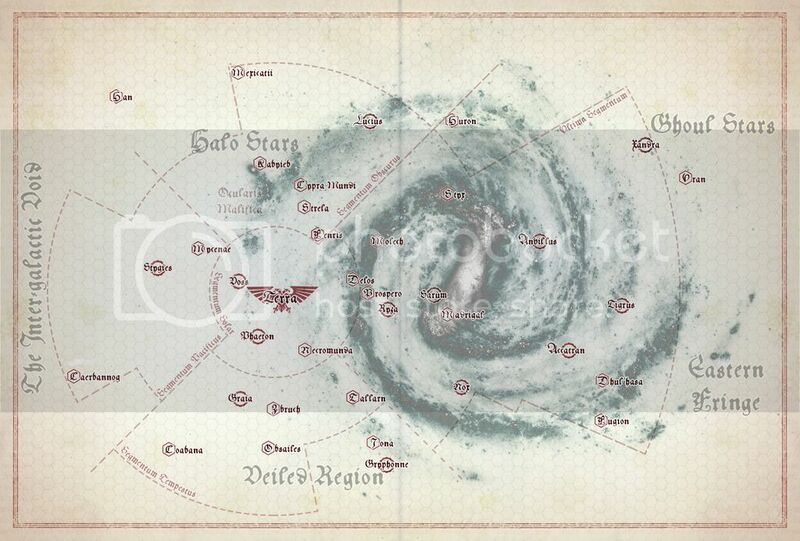 Madrigal should on the northeast boarder of the Maelstrom, between it and the galactic core. So a good way to judge that location (going off your map), would be to draw a straight line to Sarum from Madrigal (where it is now). Have that line go through Sarum half again as far and that is where Madrigal would be. Faction: The Iron Bears of Daer'dd. You're an invaluable part of this project, Grifft. And yesh, you are invaluable. Edited by AlphariusOmegon108, 29 October 2015 - 08:14 PM. Draw a line from Coabana to Iona. Half way between the two is Obsailes. Fire gives light removing dark and shadow. Fire gives purity driving out corruption. Fire gives strength consuming weakness. This is some great work Grifft. My planets are virtually perfect as well (mostly because I had barely any idea myself of where they were). And fun thing is, that nobody has grabbed the same spot. Edited by MikhalLeNoir, 29 October 2015 - 10:33 PM. Yeah. I was initially a little worried that people might want to be in the same areas, so we'd get a cluster effect going on. But it seems like we're reasonable spread out. Pacificus seems a little empty, but it would be, due to the lower density of stars. Anyways. I've updated the first post with the extra locations. Does anyone want to put Exemplary battle locations on here too? There's probably enough space for a couple at least. Either that and/or we could put down the ambush locations for the opening of the Insurrection. Will non-Astartes faction planets be added to this? Yep. If you have important planets that won't be on top of one another I'll add them. I won't guarantee all will stay for the final version, as some editing my be required to avoid it potentially becoming too cluttered. However I won't be biased in favour or against Legion assets, intentionally at least. Ultma Segmentum for Styx, perhaps 10 hexes 'north' of Madrigal. Seems like a good place that the Lightning Bearers and Wolves could be operating in at the time he was found. There is a dark 'void' between the Star clusters around that point. Somewhere in there seems kinda give good placements. I will second third and fourth all comments regarding the brilliance and effort you have gone to. I cannot remember if I ever thabked you for the pdfs you sent over, but these look absolutely incredible. Ok, updated again. I added Nox in southern Ultima as it felt like there should be more in that due to star cluster density. If you hadn't given me the option though I wouldn't have done so. I may well take you up on that offer simison. *Brandishes pen* It's what I do. Hey ho, I hile reading to betrayal once more. I would move the position of caerbannog a little mkre the the fronter line of the void. Just a little si that the planet is exactly on the forth line of the fronter lines left. Edited by MikhalLeNoir, 31 October 2015 - 11:06 PM. I wasn't planning on it specifically. Though I could potentially mark down the domains/empires of specific legions/factions with map labels. So it wouldn't have defined borders, more of a this general area is the domain of the Crimson Lions. It's something I can add in for now, but I suspect they would be relatively low on the scale of importance so would be removed first if I need the space. Which tactical "holes" were in the Space Marine Legions?